All times are Australian Eastern Standards Time which is UTC + 10. Move your mouse pointer over images for captions and times photos were taken. After a restless night under the feather doona I awoke at around 7.30am, quite hot, which I thought was unusual for June!! When I rolled out of bed I braced myself for the shock of the cold air that would grasp my warm body, and when I rolled out, I felt quite warm. Most excited I ran out to check the outdoor temp. It was 17.5C. I couldn't believe how warm it was. After realising just how warm today was going to get, I felt a little disappointed that such rare heat in winter would be wasted on a day with no chance of storms! WRONG!! When I read the forecast and saw the chance of thunderstorms, and was filled with that immense joy that storm chasers get on a surprise potential storm day. I quickly plotted the LFTX on AVN and was a little disappointed to see only 0 to -2 LIs for the Northern Rivers region. I had a quick chat with Anthony Cornelius and he said that the downs was the place to be as far as instability went, with LIs around -2 to -4. 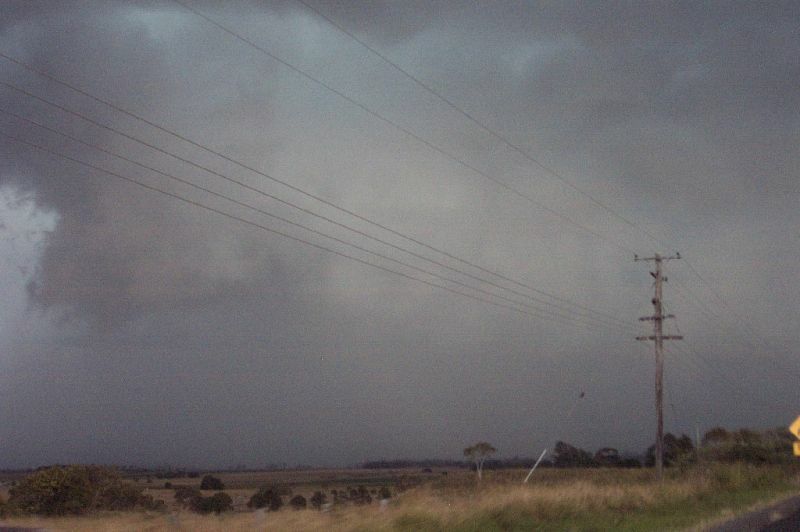 The surface trough in the morning was SW of the border ranges. He then mentioned the phenomenal shear! Although directional shear was not great (winds mainly from the NW throughout the atmosphere), the jetstream was reaching 50-60 knots at 700mb!!!!! At these speeds there was potential for severe wind damage and even tornadic activity. By 300mb the wind was approaching 110 knots!! 500 temps were around -14C and humidity was quite high throughout the atmosphere, indicating a reduced potential for large hail. 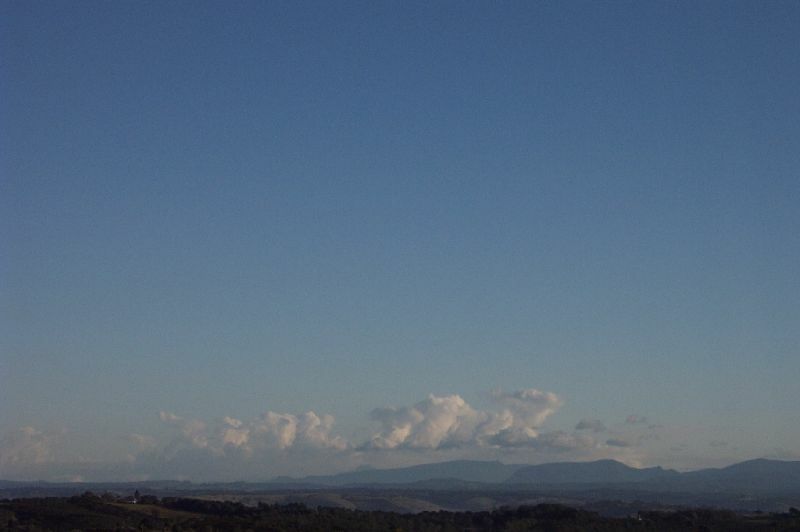 At 8am there was some very small congestus on the ranges to the NW, but the sky was clear everywhere else, but had 'that moisture haze'. By about 11am I was getting a little worried at the lack of development with no clouds overhead. 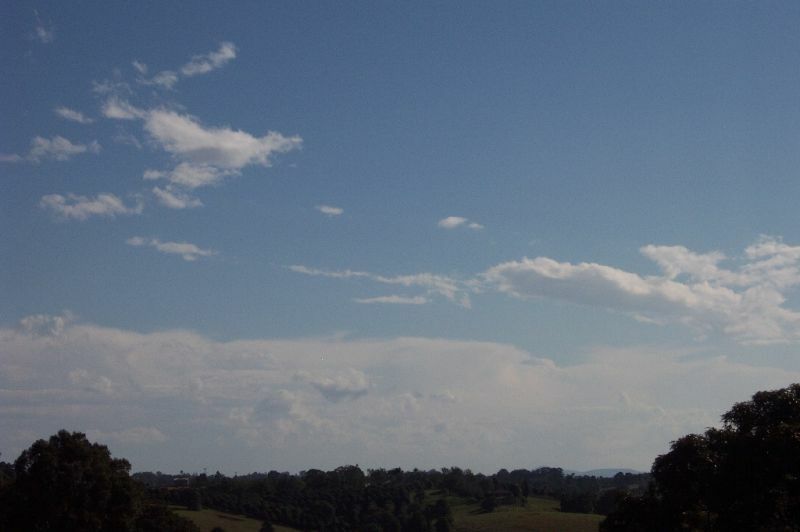 However about 30mins later I noticed some weak development on the ranges to the NW. We had friends around for pumpkin soup (a badly timed winter dish for this day! ), so I wasn't keeping the closest eye on things as I feared my parents would not be impressed with me constantly ducking out! 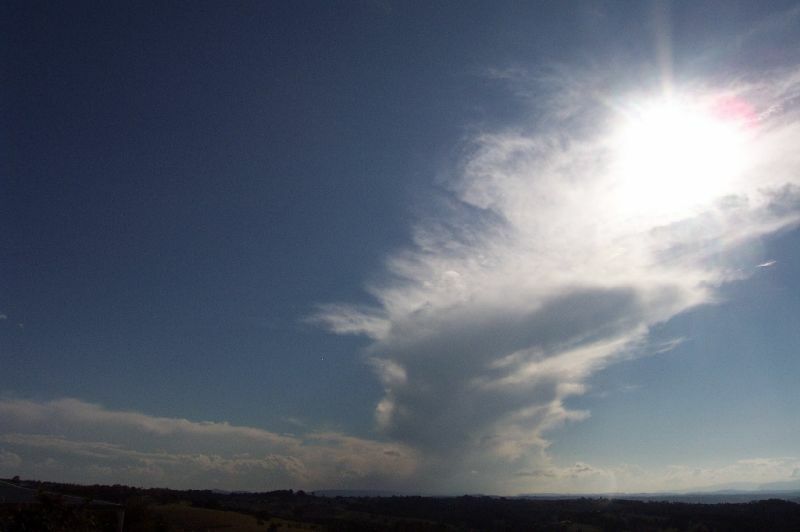 At around 2pm anvils were stretching out from the NW and blocking the sun. It was all looking rather weak though, and Michael Bath was a little concerned the strong shear would rip any developing storm apart. I told him I was going to try the 'positive outlook' on today rather than the critical outlook I usually have. 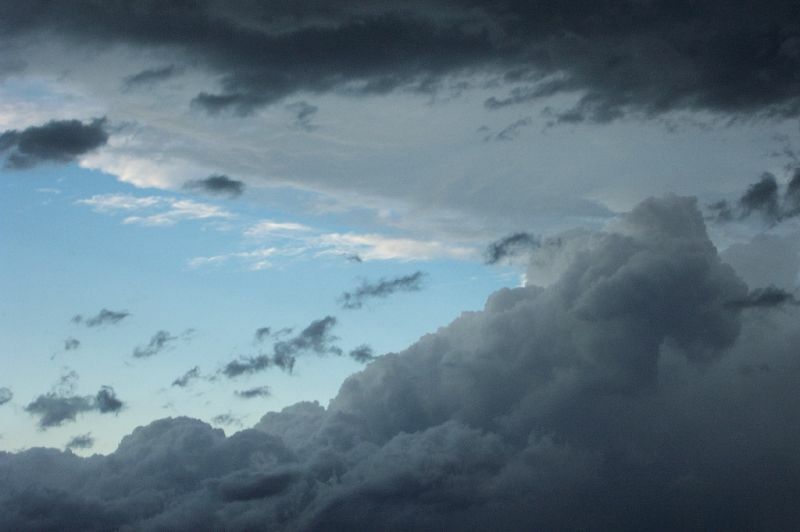 I went for a bike ride with my friend (first one in like 2 years - bike ride that is...) and she surprisingly noticed the storm activity and was quite interested. I was most surprised, as I didn't think she was that interested, but I explained the setup to her. We got back about 2.15pm. I was getting quite interested in radar, and continued taking some snapshots of the distant development. At around 2.40pm I checked radar and saw that two cells in the pink were heading towards Casino, and wondered, 'why am I not out there'. After receiving harassment from Anthony about not being out there I decided to head out! My friend volunteered to come along without me even asking!! I decided to call my other friend who had said in the morning she would love to come storm chasing if there were some storms in the afternoon. So we all met up and were on our way to Casino by about 2.55pm! Heading in I was a little worried on where to go. 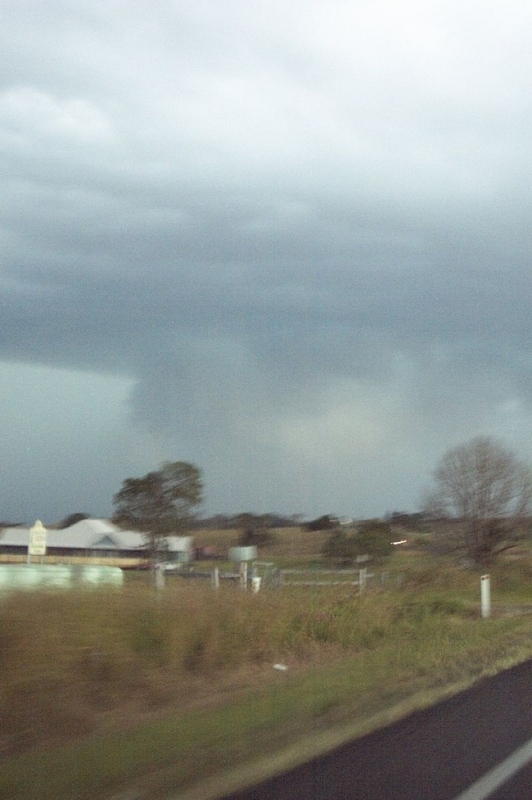 I had never been on a proper storm chase without Michael before, and so missed his guidance. 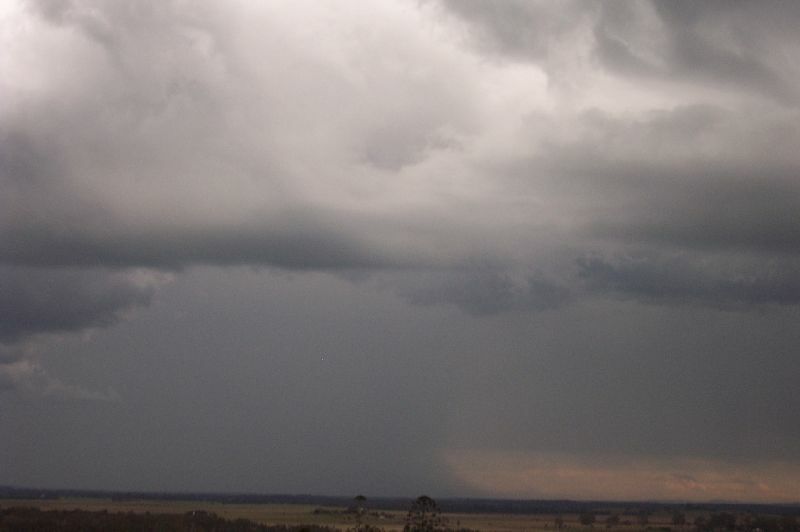 It looked like the first storm had already passed Casino and I was tossing up weather just watching from Lismore and waiting for a cell that had developed further east than the rest to come through the Lismore area. It looked weaker however, so I thought I'd take the chance and head to Parrots Nest, half way between Lismore and Casino. When we arrived we could see the back end of the first cell. It had a rainfoot at the back and I explained to my new storm chasers that it was a sign of microbursts meaning strong winds. 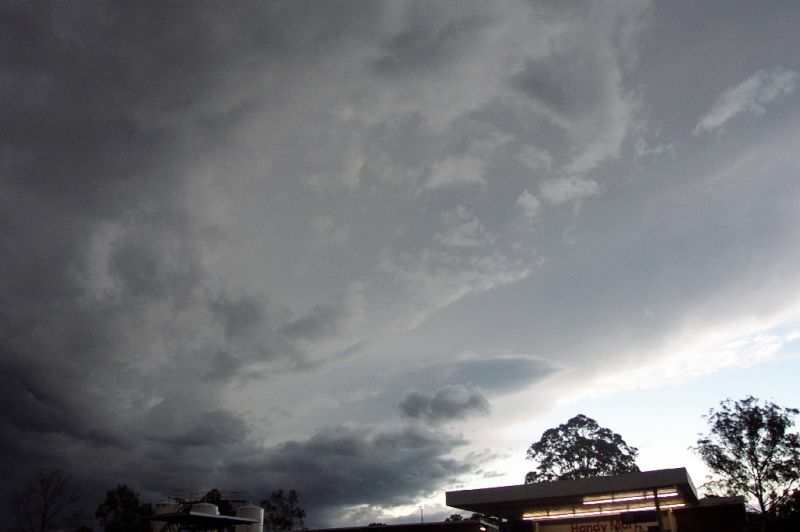 There was another storm looking quite dark to the NW. 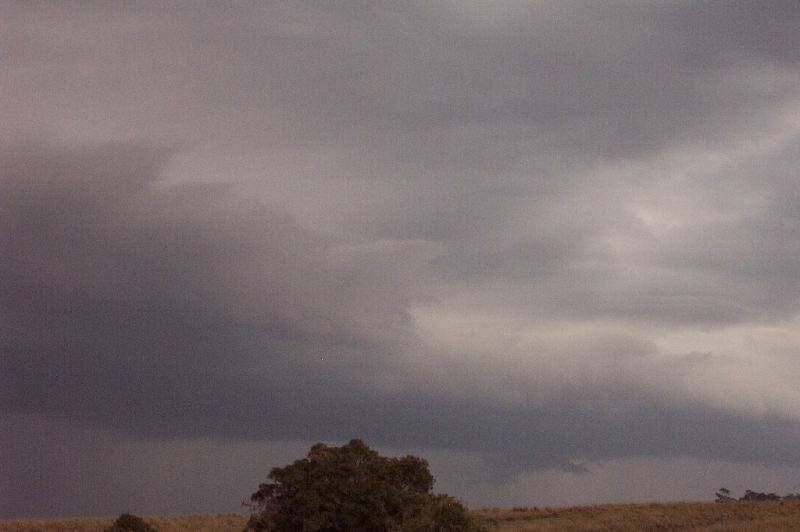 I thought that the base of this cell (what I thought to be the base), was rather circular looking. At the time I used the word 'meso', but that comment was probably unfounded now when I think back, and also, my lack of understanding. What did make me wonder though was a small lowering towards the back/side of the cell. 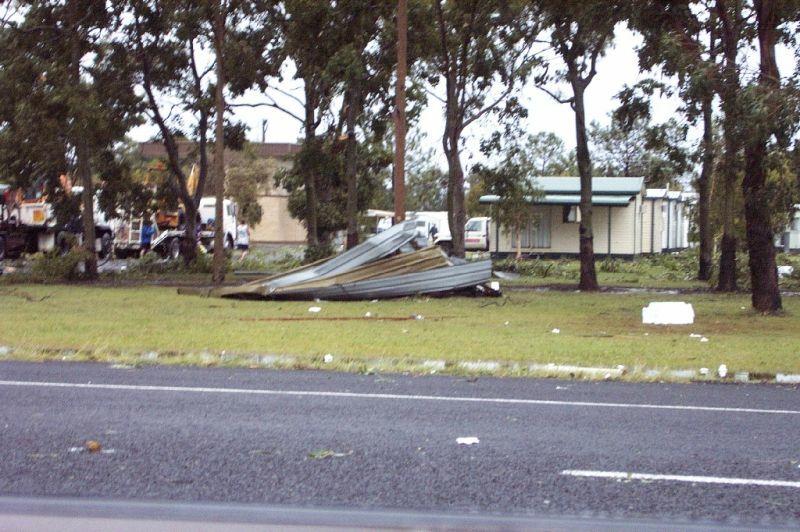 I gave Michael a call at his home at around 3.20pm, and he said that a cell was in the pink and heading for Casino and an STA had been issued for the Northern Rivers for severe winds. This advice is valid until 9 pm and it should not be used after this time. these are expected to be severe, with damaging winds. He told me to wait a second till he loaded the latest image. I was shocked to here him say 'big blob of red, get into Casino now'!! 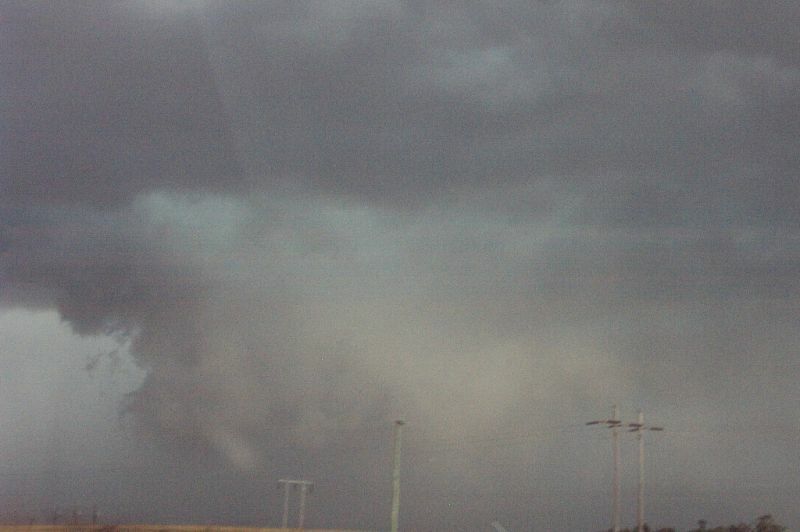 We dove into the car and headed towards Casino, and as we did, a sus lowering developed in the region I had previously noticed the smaller lowering. 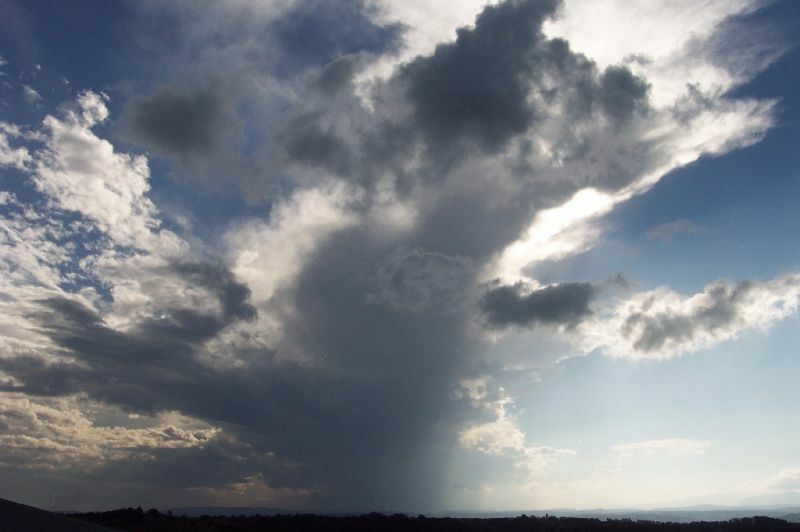 It was rapidly developing, and went all the way to the ground! I couldn't believe it!! None of us could!! We kept speeding towards Casino, and as we did this thing just grew and grew!! I was sure it was a funnel, and a massive one at that. I gave Michael a call and let him know what was going on. But it just kept growing larger and larger, and took on a guster appearance. It looked like January 17th guster all over again, but viewed more side on. The guster had passed us by the time we got close to Casino. We entered the storm from it's side, and watched with excitement as a wall of water came rushing towards us (or us to it). 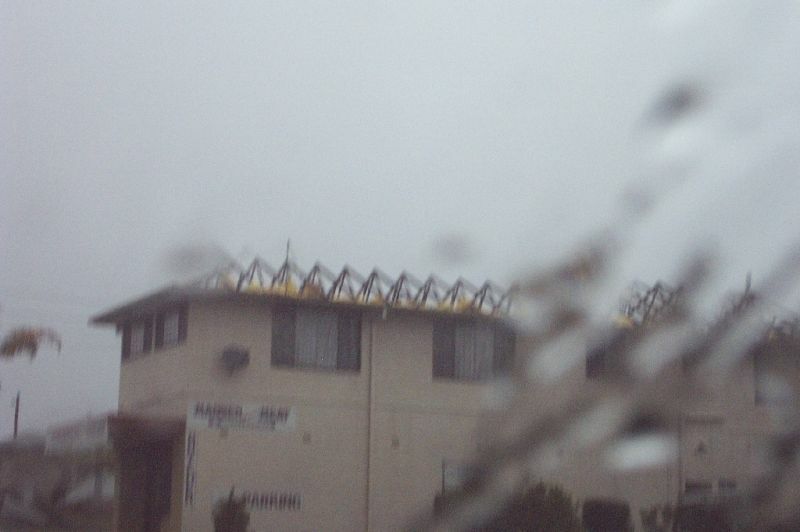 There was intense rain, with very strong gusts coming from the SE, blowing the car all over the place. It was so exciting!!! This continued for a while, but by the time we reached Casino, it was pretty much over. We got into Casino around 4pm. 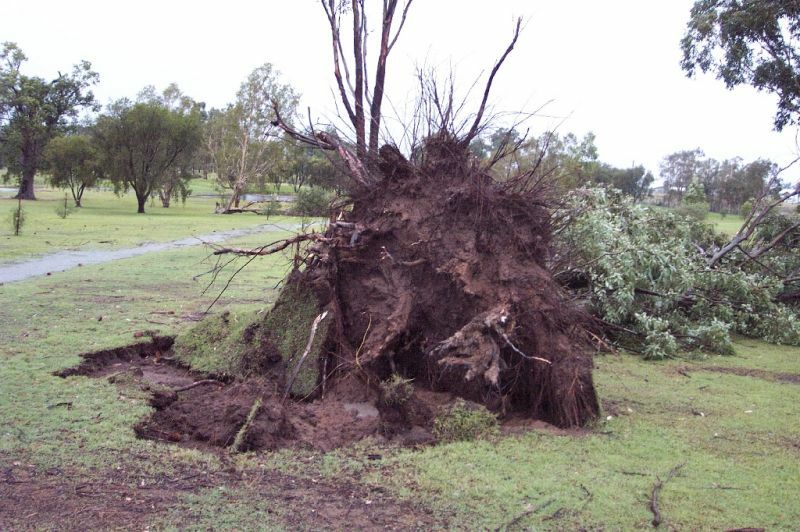 There were large branches down, then a little further trees down, then a little further, rooves wrapped around trees and debris scattered everywhere!!! 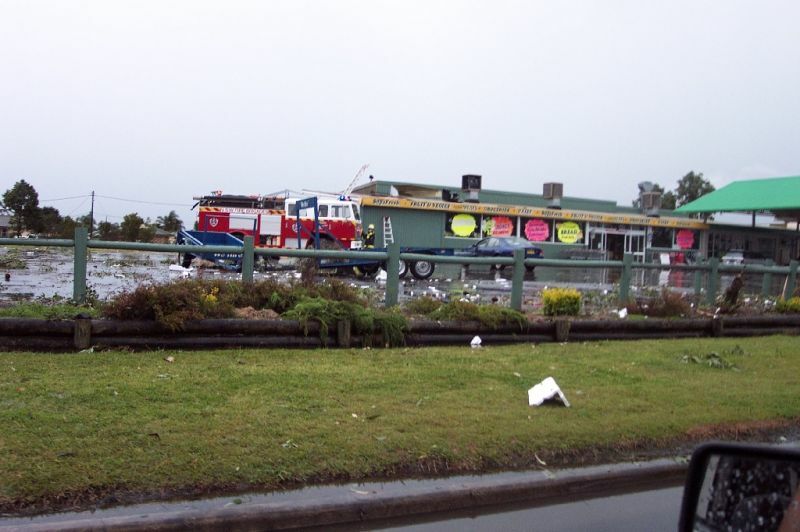 We followed a fire truck to a butchery, and it's entire roof was gone. We were astonished!! 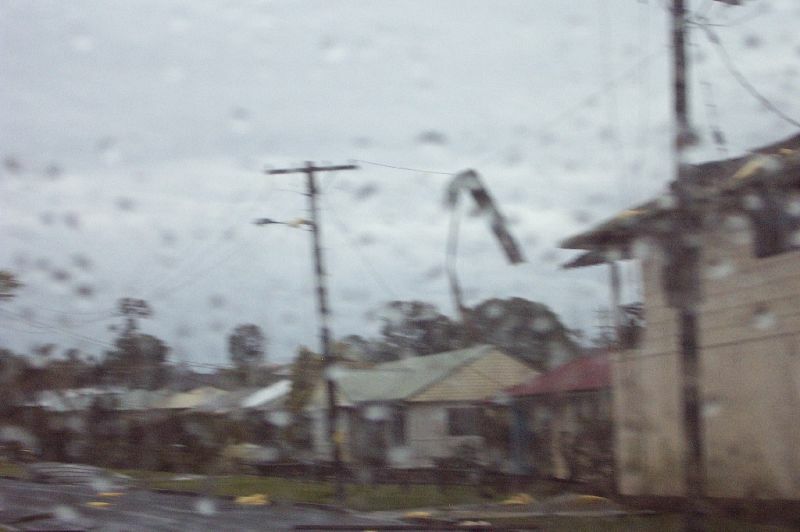 It's roof was in powerlines and peoples yards up to 500m away!! It was interesting to note that damage was very localised to two areas of Casino. The very eastern part of Casino and the central NW part of Casino. Other places looked barely touched. 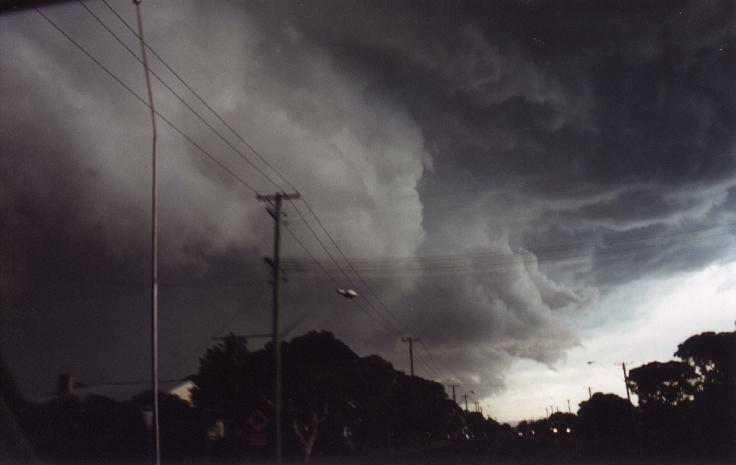 We were on the phone to Michael again and were informed another cell was heading for Lismore. 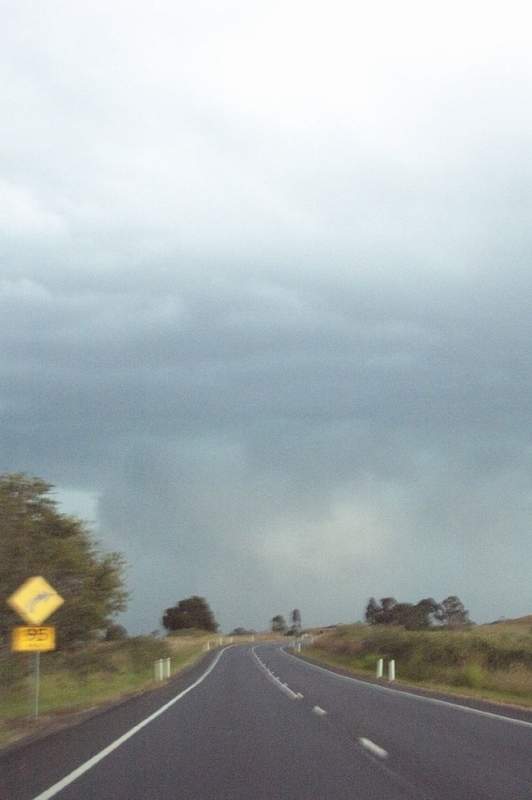 We headed back towards Lismore, but the storms were just roaring through, and there was no way we could catch it. We got to Lismore around 4.30pm and were treated by a great view of the back of the cell currently affecting the Alstonville Plateau. 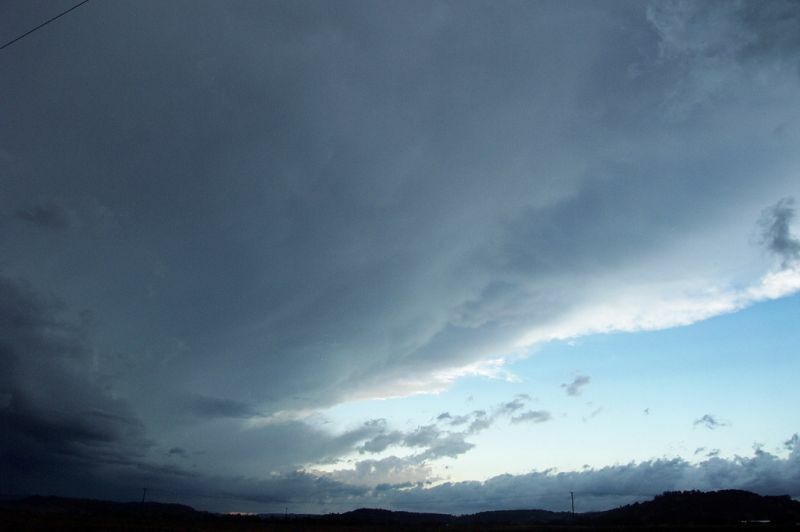 Another storm was developing to the NW, and had it's anvil stretched overhead with a bit of mammatus. 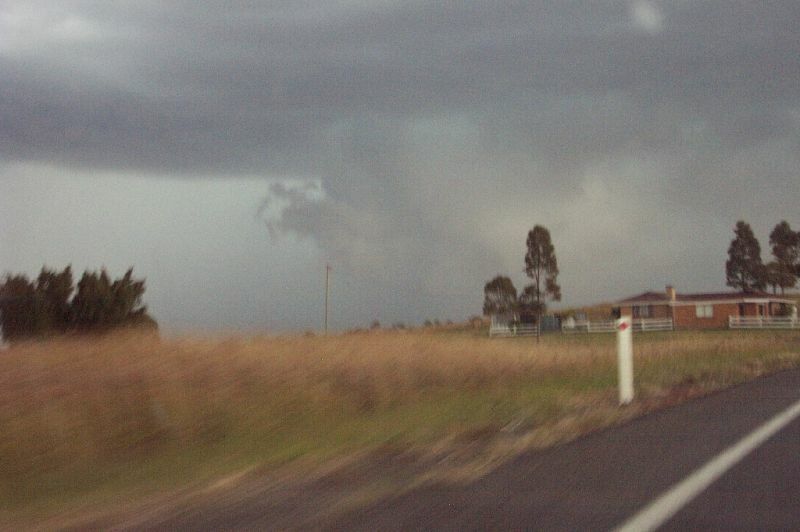 We stayed in Lismore waiting for it to arrive, and watched a small guster roll over the area. Lightning was fairly frequent, and the rain pretty heavy. It was about 5pm and I decided we may as well head towards home and enjoy the weather for longer. It was great fun driving in the torrential rain! The sky was now almost constantly alight, and when we reached Lismore Heights, we were getting some small hail, but not much. 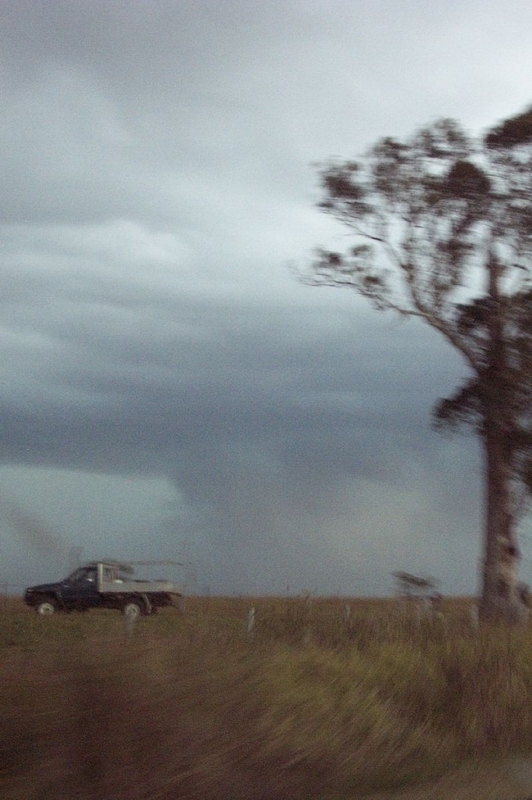 This continued on the way home towards Wollongbar and there was one big flang (the closest I've ever witnessed) that flashed right near the car, making the ground shake (even though we were in the car!!). When we got home it was just pouring. Not sure of rain rates as my parents had turned the PC off. This continued for a little while till about 5.40pm. 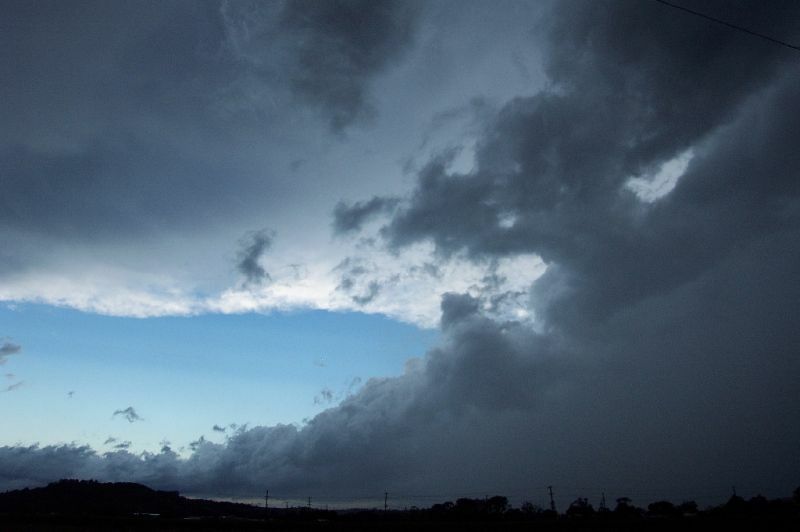 In the next 3 hours, another 2 bands of thundery rain came through, with some booming CG's. Out to sea in cloud CC lightning was constant with a few CG's. I went to bed at around 9.20pm, very contented, and very awake!! It sure was hard to believe that today was the 16th of June, and not the 16th of January!! 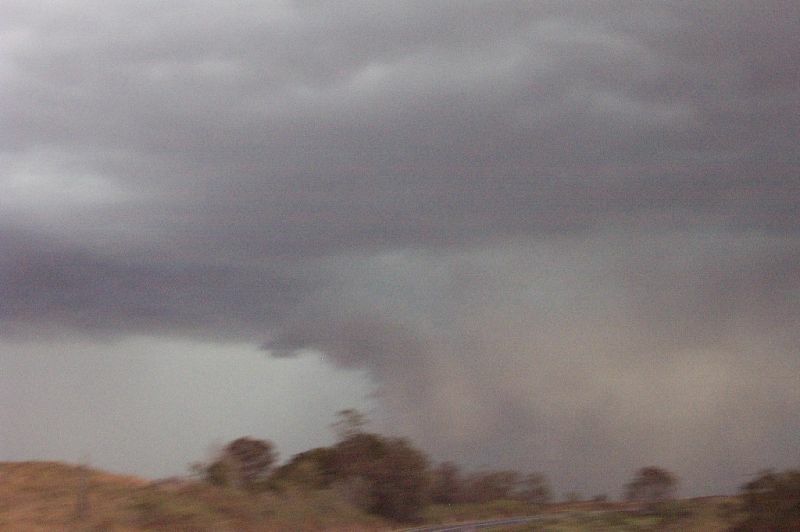 The following pictures were taken of the cell that hit Casino around sunset from SE QLD. 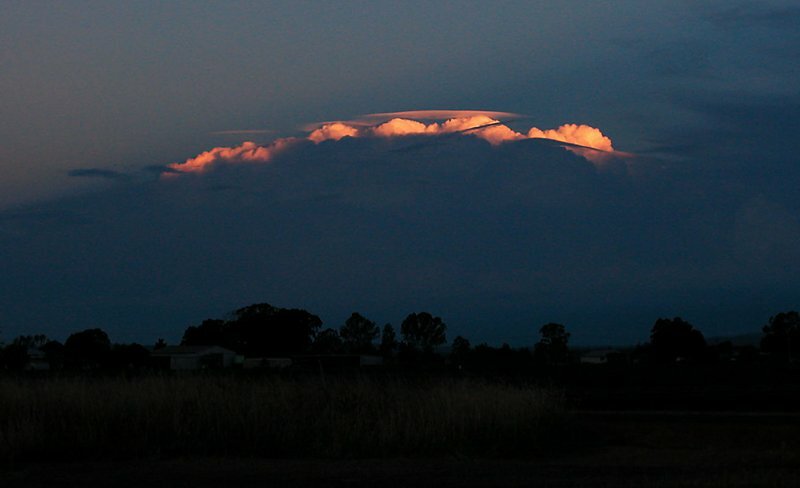 Note the beautifully sunlit pileus caps on the updrafts of the cell, which often indicates strong updrafts. Photos by Dale and Filski. 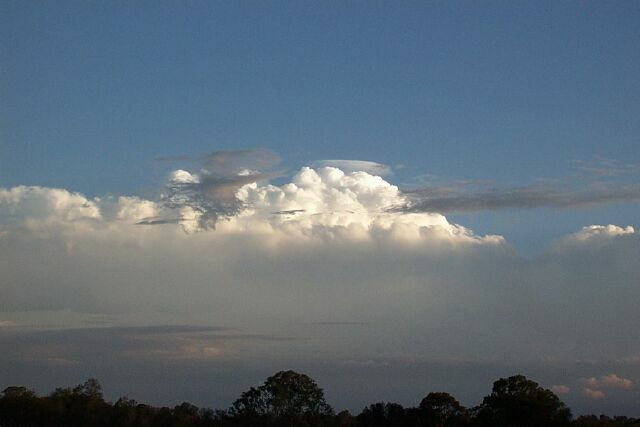 been further storms and these seemed to have developed closer to the coast.